Atelier Turquoise guesthouse is the brainchild belonging to Charlotte Everaert, a fashion stylist turned hotelier. Initially established as a ceramics company over a year ago, Charlotte has expanded her mother's project further by evolving the brand into hospitality. The newly renovated cosy abode boasts rooms that are unapologetically different in style, though 100% in keeping with the curated theme. Such bold tones and the Mediterranean influenced suites is quite unusual in comparison to other boutique accommodation in Ghent, making it an up and coming newcomer on the scene. The eclectic guesthouse is located in a 20th-century townhouse and is superbly situated thanks to the close proximity to the centre by walking, tram and bus. Citadel Park is a 3-minute stroll away, making a picturesque spot in warmer months to relax and have a picnic. You're also close to the train station, shops and supermarkets, making it ever so easy to fully immerse in the city. After a day of exploring you return and enter the property only to be greeted with the most sultry green corridor, you know you are back in your warm and cosy home-from-home. The two suites offered are unique in style and space. Apollo Suite is one for the grown-ups. It is sultry, regal and sophisticated. This street-facing suite has opulent purple shades, high ceilings, and a stylish mirrored chimney breast. This is a suite best suited to independent couples, that don't require additional facilities and simply need a stylish haven to retreat in after a day of cycling around the city. The suite has a private bathroom, which is complemented with Moroccan tiles, a refreshing rain-shower and scented amenities. Guests can also find a living area adjacent to the bedroom, a lovely contrast to the historical setting outside, it has an Emmanuelle chair perched with pride in the corner by the bay window. This space is perfect for getting ready or a simple nook for relaxing on a balmy afternoon. Boho Cave is a Mediterranean hideout inspired by a trip to Ibiza. It has a muted colour palette and airy feel that breathes tranquility. Although located on the lower floor, the apartment has more than enough light thanks to the strategic use of light. The play on texture and curated goods is just as evident in this suite. Majorcan style wooden chopping boards, Moroccan pillows and textured walls make this place a perfect base for perusing Ghent. It's minimal in style yet has a sense of character in all the right places. 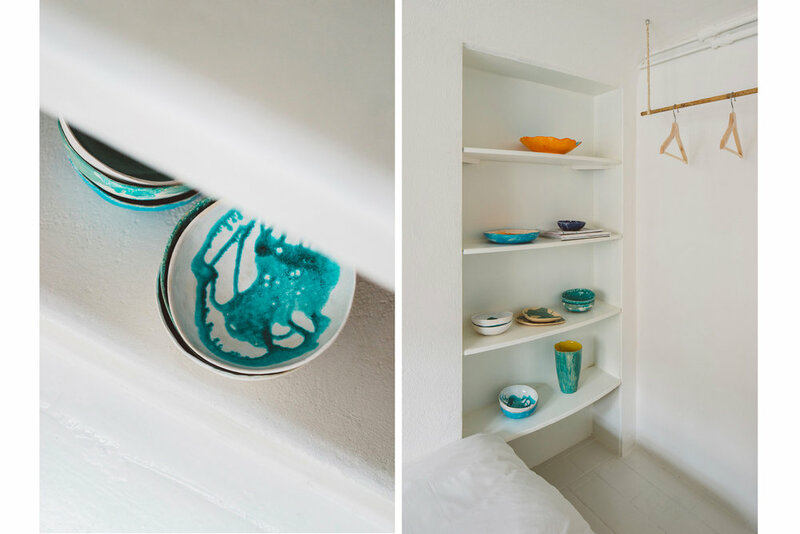 Take for example the floating wooden clothes rail and the shelving unit beside the bed showcasing exotic pops of colours from ceramics made by Atelier Turquoise. This spacious suite can be booked from 2 to 5 people. The main bedroom is the pièce de résistance, you then have two smaller rooms located next to it. There is a kitchen unit with utensils and appliances, should those staying wish to rustle up a meal. During our stay, we immediately felt settled. Spend mornings with Belgian hot chocolate and pancakes at the breakfast bar and planning the day in the breakout area. Guests can also enjoy the large communal terrace that has a bohemian vibe. Rate - The Apollo Suite starts at € 79 a night and The Boho Cave at € 195 a night. Suitable for - couples, groups, friends and families. Tips - Do go to the Korenmarket. It's buzzy and close to architectural gems. Cycle through Citadel park and have a picnic breakfast, there's no excuse not to as it's right by the guesthouse.